Picture from the Ordway Theater. “It is a glorious thing to be a pirate king,” declares the Pirate King, setting the stage for W.S. Gilbert’s and Arthur Sullivan’s The Pirates of Penzance. 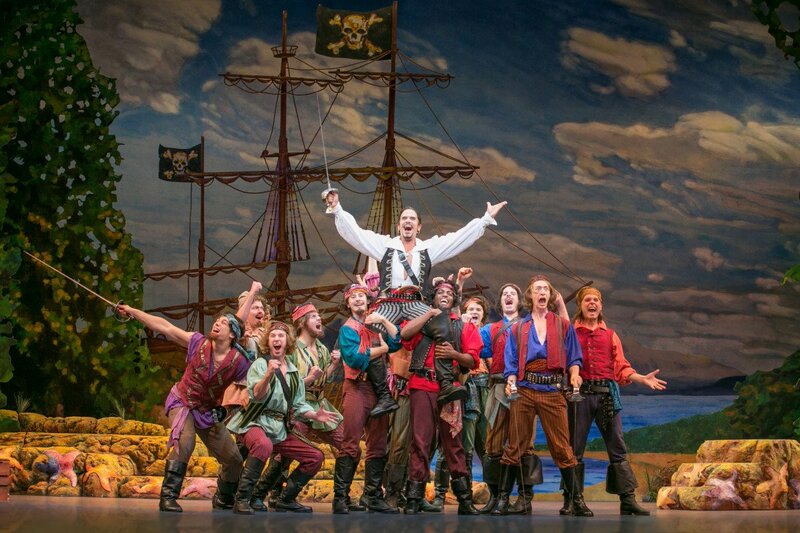 Pirates was first presented on Broadway one hundred thirty-five years ago and its most recent incarnation at the Ordway Center for the Performing Arts shows that this comic opera has staying power. The rhythms and cadences of the show is probably not everyone’s initial cup of tea, harkening back to Victorian England. But if one takes the time to adjust, the result is a very entertaining evening. Director and choreographer James A. Rocco fills the show with satirical, comic and innovative touches, things like setting the show in Canada, and highly entertaining musical dance numbers. The show concerns a young man named Frederic. His childhood nursemaid, Ruth, was supposed to apprentice Frederic to a ship’s “pilot,” which she mistakenly heard as “pirate.” Consequently, Frederic felt honor bound to serve out his apprenticeship with the Pirate King. The pirates are not financially successful in their criminal lifestyle. As Frederic points out, the group is just too tenderhearted, and so the pirates never want to attack those who are weaker than themselves. Furthermore, they release anyone who says they are an orphan. As a result, the last three ships they boarded were all filled with “orphans”, hence no booty was seized. The show opens with Frederic reaching his twenty-first year and giving notice to the pirates that he has “satisfied his duty.” He is leaving because even though he loves them individually, he abhors what they do and he intends to dedicate his life to eradicating their pirate lifestyle. Declining to change professions, the pirates wish Frederic well and insist that he take Ruth with him — who has remained with Frederic on the ship all these years. But Frederic and Ruth soon part ways, since Ruth is 27 years his senior and she wants Frederic to marry her. Frederic then comes across the many daughters of Major-General Stanley on the beach and he falls in love with daughter Mabel. The pirates return, threatening the well-being of the Major-General and his daughters. With a few more melodramatic twists and turns, the show eventually reaches its happy ending for all. But the plot only serves as fodder for the opera’s satire on class distinctions and musical tunes, which are the true entertainment. Director Rocco has done some excellent casting in the key roles of Brandon O’Neill as the Pirate King, Hunter Ryan Herdlicka as Frederic, Kersten Rodau as Ruth, and Gary Briggle as the Major-General. Dieter Bierbrauer as the sergeant of the Canadian Mounties brings unexpected humor to his part, especially with the show stopping allusion to gay marriage. The production works best when O’Neill and the pirates are on stage. During a series of songs primarily with the daughters, the show bogged down. It was a relief when the pirates burst in to raise the energy level. The show is filled with outstanding singing, especially on the rousing musical numbers of “I am the Very Model of a Modern Major-General” and “Away Away! My Heart’s on Fire.” Andis Rocco’s inventive choreography is as powerful as the singing. Steve Tyler and the orchestra do a great job overall with timing and musical quality. However, placeing the orchestra downstage was a significant drawback, with open pits and only the conductor visible. At times, it not only contributed to the inability of the audience to hear the words being sung, but placed the actors at center stage for most of the production, making them unnecessarily distant. Set designer Tom Struge’s rather cheesy opening, a decidedly cartoonish image of a pirate ship crossing the nautical background, added to the show’s humor and energy as did his design of an eerie medieval Canadian castle. Despite its minor flaws, the show proves it is indeed a “glorious thing” to spend an evening with these slightly dimwitted but orphan-friendly pirates.